While I was away in Papua New Guinea, Apple released Final Cut Pro X, which has been entirely revamped from the previous Final Cut Pro software. For normal people, this isn't exactly earth-shattering news, but for video editors (and possibly also for photographers), it is. The changes to Final Cut are so significant and at such a core level that the initial feedback from parts of the video editing community, i.e., those people who've invested lots of time and effort over the years to become proficient with FCP, was overwhelmingly negative. This caused me stress. Not because I'm a video editing expert (not by a long shot! ), but because I had recently invested a great deal of effort learning the basics of Final Cut Pro, and I wasn't all that happy with the prospect of (a) unlearning and re-learning everything, or (b) possibly even having to switch to something else. In this context, I contacted my friend Mary Lynn Price, who is an Apple-certified FCP Pro and also the driving force behind DiveFilm.com, to ask her opinion. She's just started playing with the new software, but she's already come to the conclusion that she "loves it", in her words. Since Mary Lynn makes her living using FCP, this came as a huge relief. After talking with Mary Lynn, I'm coming to the view that...while there are certainly still teething issues for the newly launched software...for people who want to edit home videos, put together quick-and-dirty short productions, and create multimedia essays (me! ), FCPX might actually be a welcome development, as opposed to the abomination that some early reviews have suggested. In this informative hour+ conversation, Mary Lynn highlights some of the key new features that many photographers looking to create multimedia pieces may find useful...like working in native H.264 format for DSLR footage (no transcoding! ), one-click color balance (similar to the white balance function in Aperture and Lightroom) and clip auditioning (think: being able to try on clothes before you decide what to buy). So if you're just starting out with multimedia or wondering about if and when to try FCPX, it's worth listening to what she has to say. Toward the end of our chat, we also talked a little bit about the skills and art involved with telling a story, whether through words, photos, video, or a mix of all these. Mary Lynn is currently working with researchers at Montana State University to document Weddell Seals in Antarctica. 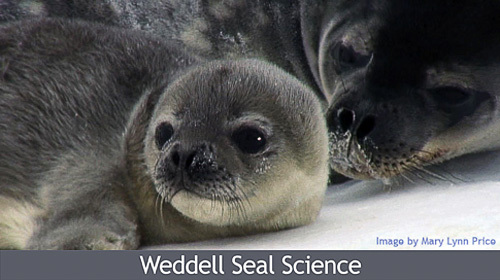 Check out both the DiveFilm HD and Weddell Seal Science podcasts. Note: When I was recording this, somewhere near me, someone turned on machinery that made a low-frequency throbbing sound, perhaps a large aircon unit (since it's boiling hot right now), which I wasn't able to hear while we were talking, but came through really loud on my voice track. I had to edit that out, which makes me sound at some points like I'm in a tunnel with cotton in my mouth.